What do you want to know? It's here. Asus has announced its second generation Padfone – the Padfone 2. The original Padfone was a fine concept – a tablet powered by a phone which you could slot in and out - but it had several launches and false starts. So Asus has decided to return to the drawing board and produce the all-new Padfone 2. However the new Padfone doesn't totally replace the original, but is a second product that sits alongside it in the range. The biggest change between the original Padfone and its successor is the design. Gone is the cover for the docking bay, now replaced by a slide-in slot for the phone part; the tablet is referred to as "the Padfone station". The slide motion is undoubtedly impressive and whatever is on your phone screen is transferred to the tablet when you slot in the phone, even if you're playing video or music. The phone part of the new Padfone has a 4.7-inchSharp Igzo Super IPS+720p HD display with an impressive brightness of up to 550nits and a strong covering of Corning Fit Glass. The tablet has the same 10.1-inch IPS screen as the Padfone 1. 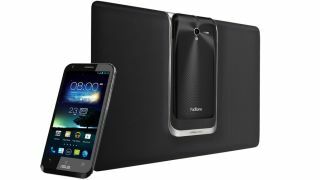 The phone/tablet combo will ship with Android 4.0 Ice Cream Sandwich, although Asus has promised an upgrade to Android Jelly Bean sooner rather than later. The new Padfone sports a powerful 1.5GHz quad-core Qualcomm Snapdragon processor inside based on ARM's latest-gen Cortex A15 design with Adreno graphics. Asus claims a 30 per cent processor performance improvement over the original Padfone with double the graphics power. The Padfone has a whopping 13MP camera on the rear, and a 1.2MP one on the front for video calls and conferencing. The rear camera also boasts some other impressive specs; it can shoot 30fps 1080p video, 60fps 720p video (twice that of the HTC One X and Samsung Galaxy S3) or up to 100 continuous still shots at full resolution. That means it'll shoot 6 per second, twice as many as the HTC One X and one more than the Samsung Galaxy S3. Asus says it has worked hard to improve its proprietary SonicMaster technology for better bass and volume whether you're using the phone or the tablet; and for different apps such as games or music. There's an Audio Wizard app on the device so you can adjust the audio for different environments. The Padfone 2 features 2GB of RAM on board, while the device is available in 16GB, 32GB and 64GB versions globally – it appears that European countries will only get the 32 and 64GB models. You also get 50GB of cloud storage thrown in for two years with Asus WebStorage which supports instant upload of images. Asus has also produced several proprietary apps. There's a SuperNote app that features character recognition and handwriting support rather like the Samsung Galaxy Note 10.1. A so-called SmartKit includes dual-language input as well as instant translation. Asus Cloud also supports native Microsoft Office in the cloud, so you can edit in real time when connected to the net. The phone is powered by a 2,140mAh battery that can support up to 13 hours of use on Wi-Fi, 16 hours of talk time and up to two weeks on standby. When you plug it into the Padfone station (the tablet part), there's extra battery, so you can get up to 48 hours of continuous use. Asus says it has also included a number of power saving technologies inside the device for different usage scenarios. The phone is 9mm thick and weighs 135g. Combined the phone and tablet weighs 649g – lighter than the new iPad, as Asus chairman Jonny Shih was pleased to tell us at the press conference. The original Padfone was 854g. Shih said that Asus had worked hard on the components, the result being that it was now 40 per cent lighter thanks to "space-grade aluminium". As you'd expect from any new high-end mobile device, there's 100Mbps LTE support as well as NFC for mobile payments. The unit announced in Taipei offers support for the 900/2100MHz WCDMA frequencies and the 800/1800/2600MHz LTE frequencies, though there is also GSM compatibility for Europe and elswehere. Data connectivity for both parts of the device comes from the phone's SIM. The Padfone 2 is hitting Taiwan next week, and will be available with or without the tablet station. We are told that Padfone 2 will be available in Europe, including the UK, from early 2013... which still feels like ages to wait. It's available in both black and white colours. In Europe, pricing is 799 EUR and 899 EUR for the 32 and 64GB versions respectively. In Asia, pricing starts at NT$17,990 (about $US620/£383/AUD$599) for the 16GB phone only, and ranges up to $NT 21,901 ($US749/£466/AUD$729) for the 64GB version. The tablet dock can be purchased by itself for NT$8990 ($US310/£191/AUD$299), or bundled with the phone for NT$6000 ($US210/£127/AUD$199). Want to know all about the new phone/tablet mixup? Well, we're awaiting our final sample to properly put through its paces, but for now you can check out our hands on: Asus Padfone 2 review for all your preview needs. Is it a phone? Is it a tablet? It's both.